A new study proves just how invasive Monsanto's best selling chemicals are, revealing how herbicide toxins are appearing in 75% of rain and air samples. Take a deep breath. Thanks to the massive use of herbicides across the planet, you likely just inhaled a dose of Monsanto's best-selling herbicide, Round Up – at least according to the latest US Geological Survey published in the journal Enviromental Toxicology and Chemistry. The chemical ingredient used in Round Up, known as glyphosate, as well as other 'inert' toxic chemicals, were found in over 75% of the air and rain samples tested from Mississippi in 2007 – a large river that cuts through the middle of the US, and is the basin in which hundreds of farms’ runoff drains. Round Up chemicals were prevalent, but so were 37 other toxic compounds – all present in both rain and air samples. Glyphosate was found in 86% of air samples, and 77% of rain samples. Seven compounds in 1995 and five in 2007 were detected in more than 50% of both air and rain samples. Atrazine, metolachlor, and propanil were detected in more than 50% of the air and rain samples in both years. The report states that 2 million kilograms of glyphosate were applied statewide in 2007, or 55% of the total herbicide flux for that year (~129 μg/m2), leading them to state the high prevalence of glyphosate in air and water ~"was not surprising." What is surprising is that these results are not becoming widely distributed until 2015. This estimate, if correct, reveals that there has been an ~ 18 fold increase in glyphosate concentrations in air and water samples in only 12 years (1995-2007), and likely more since the samples were taken. This means that our bodies have been under fire with biotech toxins, not just in the food we eat, but in the air we breathe, and the water we drink, for more than a decade. The longer the period of exposure we are subjected to, you can bet the more diseases will crop up. These toxins have cumulative and synergistic effects with other toxicants with incalculably complex results that produce far more harm together than glyphosate alone (i.e. synergistic toxicity). If you want to breathe a sigh of relief, you'll have to fight biotech. It isn't just the food they are poisoning. I read about this the other day. All I can say is; -Monsanto is pure EVIL! This is very worrying. 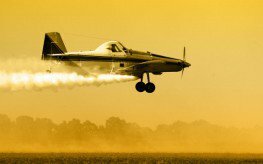 I live in the UK where, as far as I know, we don't spray pesticides by air but they are widely used, sprayed behind tractors. It is very possible that the wind catches the product and spreads it. Roundup being a patented antibiotic makes this frightening news. Have shared this with the GMO group. This is horrible. Can we stop them? I worry for my grandchildren and future generations. Thank-you for the article, and for Evelyn's as well. And by the way - I don't think it is only aerial spraying that causes this, Howard - there's wind blowing, run off into rivers & streams & lakes, evaporation, etc as well. Thank you for explaining Evelyn, I had got the idea of spraying crops from the air as a result of the photograph. I would imagine that using such a dispersal system would simply make the situation worse. Spoke with a retired veteran who worked with this stuff and he said it should not be used for anything--very bad for everything and causes a great deal of health problems. As long as the idgits can make $$$$ they don't give two hoots for anybody or the consequences. It's the new Agent Orange. And now Monsanto is advertising in different magazines - a big two page ad in Good Housekeeping and one in Eating Well - all propaganda and nonsense. I'm writing to the magazines to complain - advertising is one thing, brain farts are another. Complain loudly and as often as you can to whomever you can - it's our only hope. Love your turn of phrase, Arielle!